The first thing that comes to mind when you hear the words, "50th Celebration" we immediately think about something being old. However, there are a lot of positives wrapped around such a prestigious occasion. First of all, since I am only a year and eight months from gaining this experience, I am looking upon this moment as both a humbling and exciting moment, as most women...and men do when their lives are filled with a wealth of experience that supersedes many who did not make it to that point. When it comes to possessing a wealth of knowledge, National President and CEO, Beverly E. Smith of Delta Sigma Theta Sorority, Incorporated, knows this all too well. She understands about family, sacrifice, and commitment. 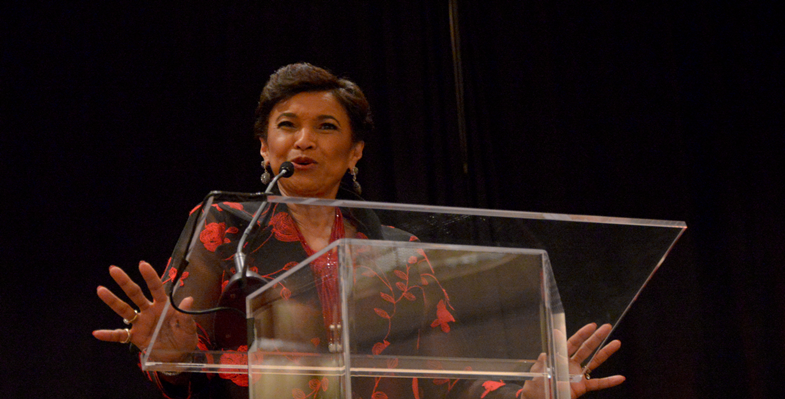 In celebration of her 50th year in her beloved DST sorority, she has so much to be thankful for and even more to look forward to in the future. In an interview with her, she shared all of the pinnacle moments along her path that have led to where she stands today. Take a walk with me as I share a half a century of a legacy stemming from the humbled beginnings of a family who set the pace and modeled the behavior for a little girl who would become the leader integrated into a long list of trailblazers, with her father leading the way. Every great elevation of success began within the confines of a "valley experience." Beverly's father, Louie Evans moved from Tallapoosa, Georgia to Ohio in the 1910's during a time where racial tension, hatred, and lynching were a part of the norm for those living in that era. He only had a third-grade education, but he attended night school, after which, he went on to attend Akron University and an electronics school in Cleveland to become a TV repairman. Getting an education was an important part of his life, along with serving his country in the military where he earned two bronze stars. As if that wasn't enough, he was quite the accomplished jazz pianist who played in the USO band behind the likes of President Beverly Smith's Soror Nancy Wilson and Bob Hope, both legends in their own right. Louie Evans, was determined to not only make a life for his family and himself, he was also committed to standing up for those who suffered the injustices that he saw every day. He was the founder of the local Urban League, which he served for 54 years. He was known as "Mr. Urban League" in his hometown. President Beverly Smith shared this about her father, Mr. Louie Evans. His work was so impactful that his autobiography was made into a play by the National Urban League in 1987 and produced on stage in San Francisco at an Urban League National Convention. Over the years, he shut down the public swimming pool until black and white children could swim and play together. We integrated schools, churches and our neighborhood (even though we lived with threats). He fixed TVs and radios for the elderly and homebound, free of charge, and opened a school in the basement of our home to teach his electronics trade to young African-American men so they would have a career and a future. He had a vision for the advancement of black youth in the community. A very religious man, he became the first African-American fourth degree member of the Knights of Columbus in our part of Ohio. After years of raising a ruckus in the community he was recognized as one of the 10 greatest leaders of the Massillon area in 1980 and on May 16, 1990 the Mayor of Massillon proclaimed that day “Louie Evans Day” saying, in part: 'it is quite evident that his strength, courage and ability to fight for a fair and just cause has had an impact in the community... no problem was too big for him to handle'. First of all, I have learned that you must have an understanding and acceptance of Who you are and Who’s you are, which gives you the audacity to be your own person and instill within you the wisdom to understand the value of collaboration with others… no one can achieve great things in a vacuum. Secondly, one should be aware that "true social action is a lifestyle." It is in your (and our organization’s) DNA. It may begin with a single initiative or be sparked by an incredulous event… and for Deltas, it is ingrained in who we are and acted upon as a visceral reaction to injustice. We've all heard the saying, "Behind every good man lies a great woman." Well, I believe this ring true in reverse. National President Beverly Smith's schedule clearly is hectic and her life filled with obligations that many most husbands will be ready to either walk away from or envy. However, life has taken both she and her husband down lanes with multiple twists and turns, but the crooked lanes were made straight through the grace of God and the fascinating support from her soul mate. Stephen J. Smith is an incredibly supportive husband. He puts up with my very hectic schedule away from home, my late night calls, constant cell home interruptions, late or infrequent home-cooked meals and a tired wife. But he is also very proud and supportive of what I do and why I do it! He is also dedicated to community service and Greek life, so he understands and shares my desire to serve. We have always taken time to celebrate each other’s successes. Throughout our 46 years of marriage we’ve tried to keep communications open, made sure we agreed on how to raise our two children, shared a common faith in God, and worked to live the oath of “for better or worse.” We prayed to be good role models for our children in their marriages and I have to admit that, every now and then, there’s a good lesson or two we’ve learned from them. It's no wonder that this delightful woman is positioned in the manner bestowed upon her in this season. She is free to operate in her gifts and National DST President, Beverly Smith clearly comprehends commitment and balancing them, as to not allow it to distract, nor impede purpose. If you were wondering how she does this and has she always been such a focused individual? Here's what she said. The first thought that comes into my head is that I’m the same person before and after my accomplishments! I have always been committed to Delta but that certainly isn’t the only commitment in my life. I’ve found that an individual’s level and type of commitment varies dependent on your stage in life. I don’t believe that you can have balance in life if your focus is singular…. My constant commitment has always been to ensure that I used whatever gifts God has given me by making the best of the talents and skills I have. After my spiritual life, my personal life as a wife and mother has always been my priority; followed by my professional life and service to others in my circle of influence. I have always been an active community leader (even in college) and have served on multiple non-profit boards in leadership roles. What’s been tougher since my all-encompassing commitment to Delta is how to balance it all and not let it take a personal toll. Now we come to the end of this part of her journey. Honing in on a trait that is imperative to bridging the gaps between our past, present, and future. Commitment is key. If you are not committed to achieving beyond what you can see, how will you ever hope to achieve the heart of the purpose set before you; in order to build legacies that will last a lifetime? When you have trail blazed from the valleys of obstacles that were rocky and sometimes scattered with stumbling blocks, and gleamed the lanes of highs and lows that taught you more than you expected, then it is evident, that you have become committed to staying the course, and in my words, you are willing to "walk in PURPOSE, ON purpose." The highlights of this esteemed leader extend a whopping 50 years. I reached my 50-Year Anniversary in Delta on October 21st of this year! If I had to pinpoint one specific highlight it would be the joy of sisterhood and friendship with other women who have the same core values and commitment to service. Wherever I go, I can find a Delta and find an instant connection. I think that’s a highlight for all of us in Greek life. While it’s rare as National President, I truly enjoy some simple “downtime” with my sorors for a good talk and laugh... that’s a highlight to me! My daughter Stacy is also a soror, as is my own sister, Joan. In my daughter's case, I had the privilege to “pin” her when she became a Delta, which happened on my birthday. My best friend’s daughter was on that same line and we had the honor of standing side-by-side to pin them... that was a very special moment. Needless to say, winning my elections to rise to this level were all milestone highlights; and chairing our 46th National Convention in Atlanta, one of our largest, most successful and most profitable, was incredibly satisfying. So, what is in store next for this Daughter of the Most High God in His Master Plan? Well, I'll let her tell you. My goal is to see the actualization of my vision statement for Delta Sigma Theta Sorority. I am focused in doing all I can to enhance “joy in our sisterhood, power in our voice and service in our heart.” I truly believe that we are the greatest sorority in the world. (Yes… I’m biased.) We are an international service sorority that is over 900 chapters strong. We are grounded in camaraderie of sisterhood and born from a legacy of strong leaders in the areas of social, community, educational, and political activism. We claim five members of Congress, our previous United States Attorney General Loretta Lynch, US Secretary of Labor Alexis Herman, three … and the only…African American female surgeon generals and seven of the fifteen African-American women to receive the honor of having a United States Post Office stamp that bears their image. Our five areas of focus during this administration are: (1) Organizational Health (2) Social Action (3) Community Impact (4) Empowerment of Women and Girls and (5) Appreciation of our Culture through Arts & Letters. Details on our current initiatives can be found on our website at deltasigmatheta.org with more to come. 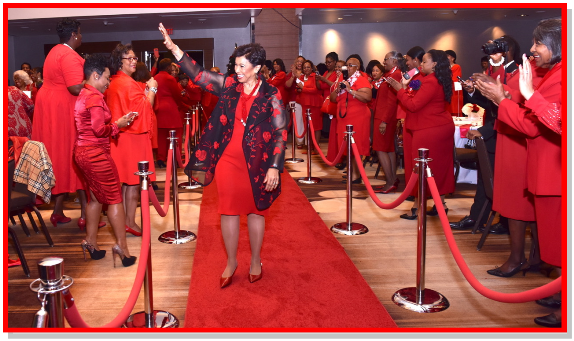 Join me in congratulating National DST President Beverly E. Smith to the pinnacle of her legacy and we at T2T celebrate all of her accomplishments. Let's all take a page from her goals. I hope to leave a legacy of strong leaders and a strong Delta Sigma Theta. I think every leader has that responsibility to the organization they lead. If we don’t, who will continue the work that has been done to preserve what’s been gained and mend what is broken for the next generation. My vision and goals include: I want to be the spark that turns on the light bulb in others causing them to see their own personal potential and understand what is within their reach. I want to be open-minded and recognize the value of the opposing view. I desire to teach – not only in the traditional way, but life lessons. I am continually understanding the gift of my ability to influence, to find the vocation that allows me to use that skill and have a positive impact. And I plan to open doors for others who can achieve beyond my scope.